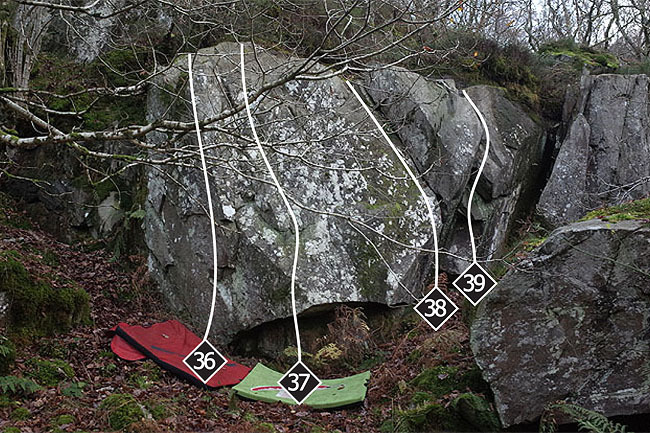 In the northern, deciduous segment of the Braichmelyn woods there is a very fine bouldering circuit. 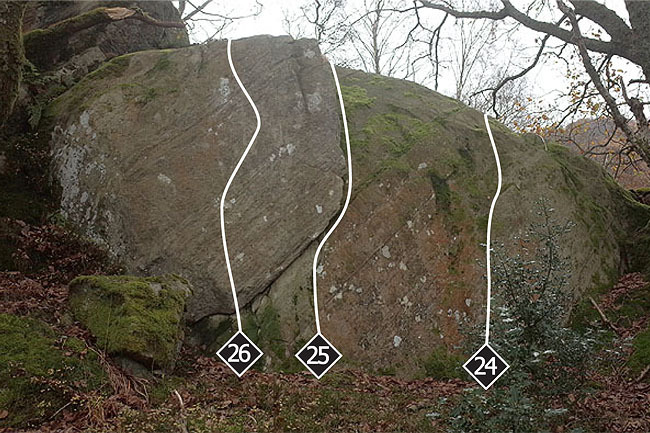 Central to the circuit is the magnificent Super Boulder, but beyond it there are numerous excellent problems dotted around the woods. The rock quality is mostly excellent and the landings are generally good. Conditions: The rock can be slow to dry out after rain, especially if there is no wind. During warm summer evenings midges can be a problem, as can the sharpness of some of the holds. It is perhaps at its best in the Spring or Autumn when neither of these issues should cause too much trouble. The trees provide some shelter, making it a good option on very windy days when other more exposed venues would be out of bounds. Approach: From the kinked Mynydd Llandegai crossroads at the Capel Curig end of Bethesda turn up the Braichmelyn road towards Gerlan. After 300m Nant Graen (a narrow road leading off right from the main road) is reached. If arriving by car continue for another 50m across the bridge over the river and park immediately in the road entering the housing estate on the left. Walk along the narrow road of Nant Graen until it ends after 100m at some houses. Follow the footpath sign directing you to the left of the houses and out through a gate on to a riverside path in the woods. Afon Caseg Gorge is situated almost immediately on the left. The circuit is described from here, moving back right and then up to the Super Boulder, and then in a series of forays spreading out to the various satellite boulders. See the individual sections for more details. The first part of the Braichmelyn circuit is perhaps its least appealing. 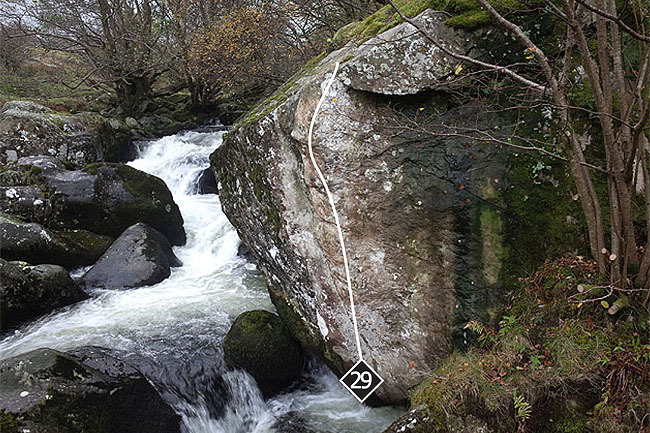 The Afon Caseg Gorge is an esoteric sideshow best appreciated during a sustained dry period. At least then the seepage will have dried up and the vegetated highball top outs won’t be so terrifying! Approach: 30m from the gate by the side of the houses and just below the riverside path a dry bottomed subsidiary gorge to the main river can be seen down on the left – this is the Afon Caseg Gorge. 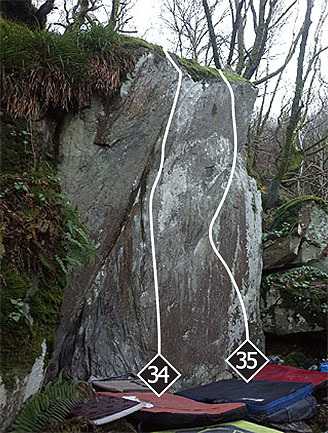 This impressive block has some of the best problems in the area. It is fingery though, so expect a rough ride if you visit during hot weather. Approach: From the main riverside path at the edge of the Afon Caseg Gorge cut back sharply rightwards on a narrow path leading at first towards the back of the houses, but then weaving up leftwards to reach a clearing within 50m. 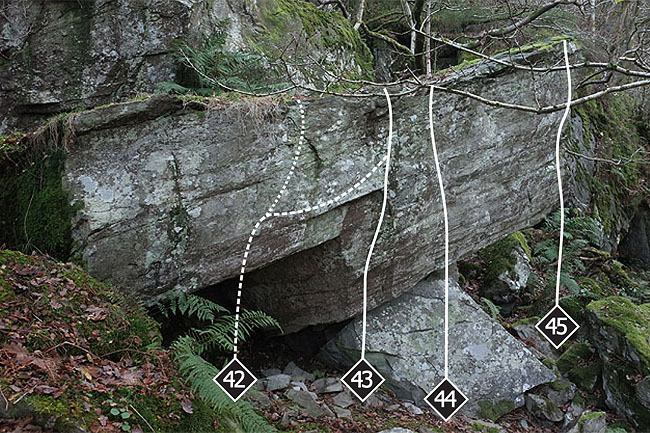 From the start of The Ramp climb directly through the bulge then with the aid of two crimps make a big rock over for the left arête of the boulder. Follow Superstar through the bulge then continue up the diagonal line rightwards to a highball finish. A classic problem following the attractive rightwards curving ramp feature. 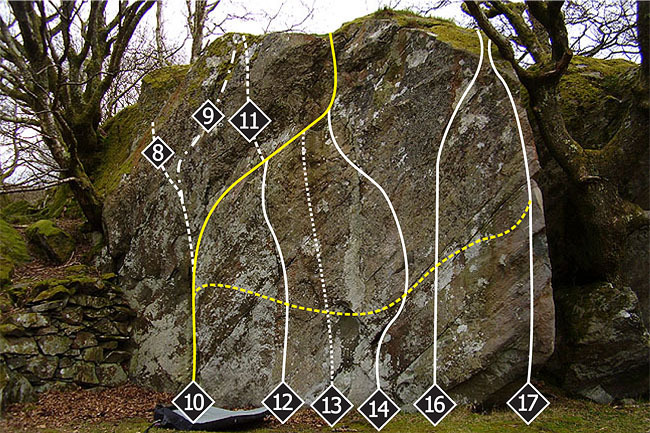 After an initial crux section the holds improve, but there is still a memorable highball finish to be dealt with. Follow The Ramp to the good hold after the first hard move on the traverse, climb directly upwards from here with the aid of a hidden pocket. From the Central Wall sds follow the seam rightwards with difficulty to reach and finish up Braichmelyn Arête. Take the arête on its left side to a prominent jug. Continue with the aid of a handy branch to top out. It is also possible, but not as good, to climb the arête on its right side at a similar grade. 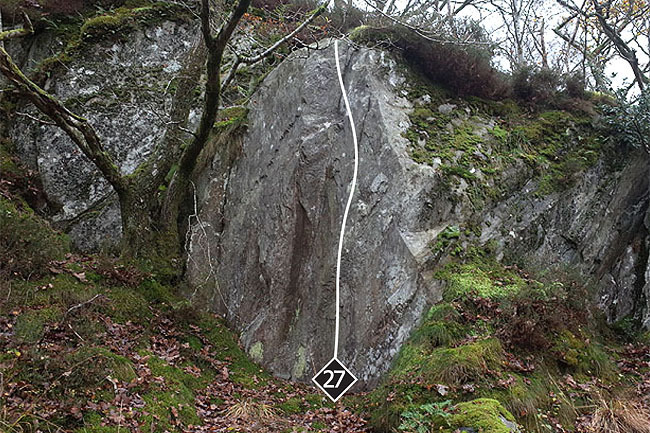 There are a couple of different methods for the powerful 7A sitting start to the left side of the arête. 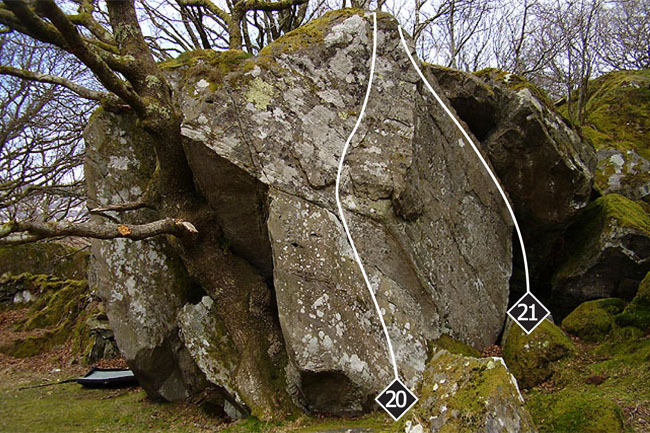 Right of the tree is another rock face with some easier problems. A pleasant, albeit rather highball line snaking up the wall right of the tree. Follow the rail leftwards out of the alcove. A couple of minor problems can be found on this nearby boulder. To reach it turn your back on the Super Boulder and walk over to another flat clearing and head round to the left. 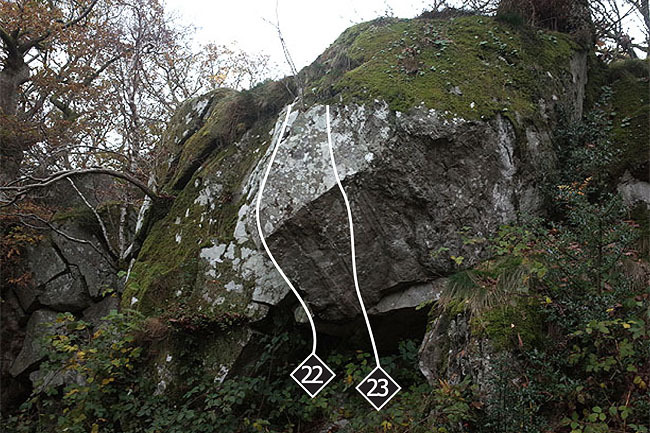 More worthwhile problems can be found close to the Super Boulder. 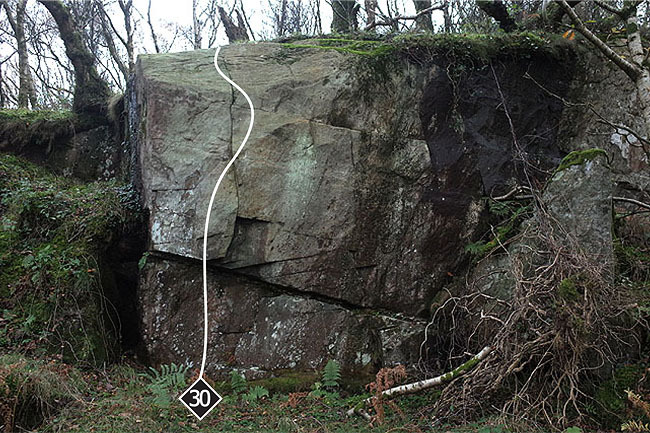 The first section can be reached by skirting the Super Boulder on the left and continuing in the same line for 30m. The slabby line right of the flake crack. 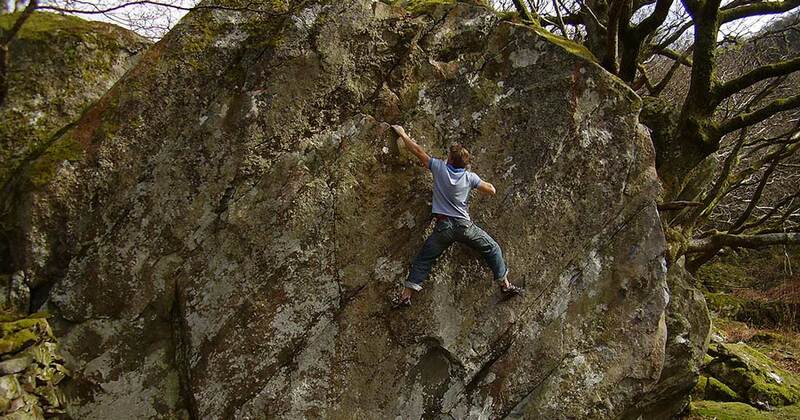 The big flake crack is a great feature – climb it! 25m farther left from Oh So Thin is a distinctive groove line. 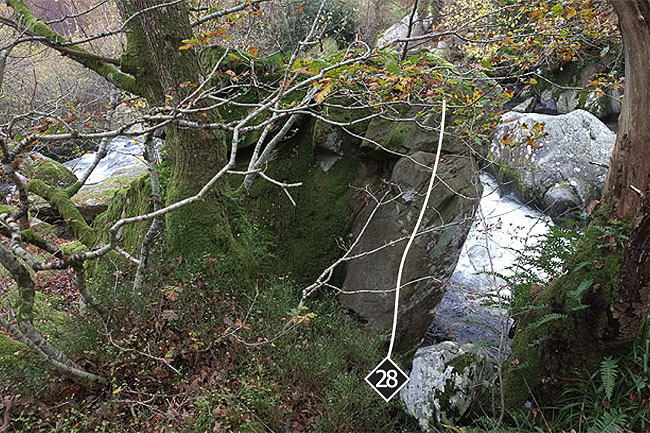 Electrophilic is close to the riverside footpath that runs up by the side of Afon Caseg Gorge. If you follow this footpath up for approximately 50m a riverside block comes into view. This section has two steep walls with some good problems and reasonable landings. From the Super Boulder walk round to the right and follow a vague path on the far side of a broken drystone wall heading up right. At a junction with another low drystone wall continue up through the woods bearing slightly leftwards. After 30m you should reach the edge of an open amphitheatre on the left. On the far side of the amphitheatre you will be able to see the two walls. The obvious line on the steep right hand wall is excellent. Some care is required topping out next to the drainage line. Deep in the Braichmelyn Woods there is an impressive leaning wall; well worth seeking out. From the edge of the amphitheatre mentioned in the Braichmelyn Bach approach head upwards until above the top right corner of the amphitheatre then trend up rightwards and round into a small upper valley. 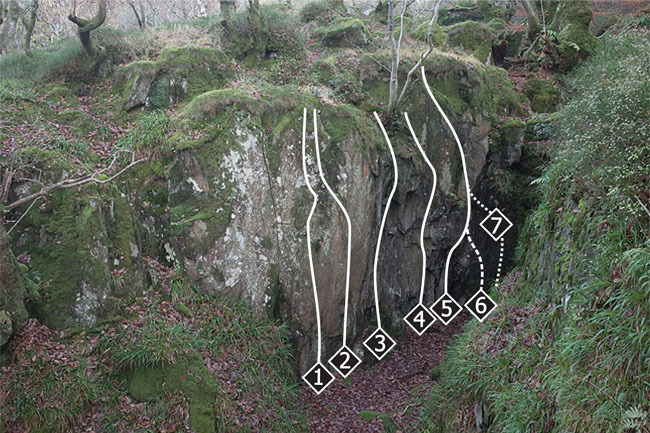 On the left flank of this lost valley you should spot an attractive highball wall. From the junction with second drystone wall mentioned in the Braichmelyn Bach approach contour round rightwards for 70m. The slab behind the block has a few worthwhile problems. Climb the left side of the arête above the sloping landing. The central line on the slab is tricky at first but the jugs soon arrive. The groove is good; just watch your hands on the sharp edged crack. The hanging groove is another good problem (when it is dry). Up and right there is a leaning arête and wall. The scary arête, following sharp holds. 41. Papa Simon’s Extra Six Inches 6A! Takes the line up the right hand side of the slightly overhanging wall, just left of the tree. Long reach for the top. Spotters recommended. Back down on the steep front face of the main block the problems are described from left-to-right. A neat little problem. Start sitting with left hand on obvious low edge on the far left of the block and right on a rounded side pull on the lip of roof. Kick a foot out right onto the Turtle Head starting jug and climb diagonally rightwards into the finish of that problem. A harder (6B) direct finish is possible. Start sitting, hands matched on the low jug at the right side of the low roof. Bounce up to the flake and exit past the ‘Turtle Head’ at the top. 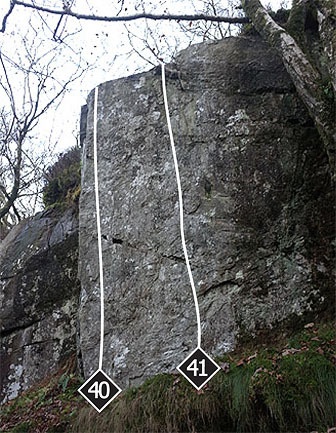 The slabby block to the right is out of bounds at this grade; an easier (4C), ‘anything goes’ version is possible. A 6B eliminate variation (Hip Op) starts on the same low jug but avoids using the higher juggy holds; use a side pull and crimps instead. From a hanging start climb directly up the arête. Try not to fall off as the landing is awful. 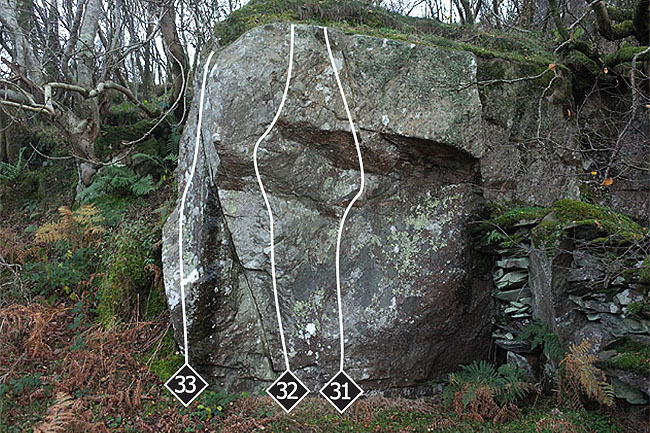 Start hanging a pair of crimps just above the lip 1.5m right of the arête. Traverse the lip leftwards to finish up BB Arête.